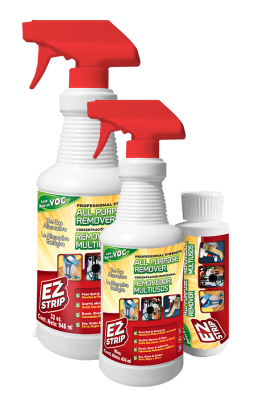 Remove tough and sticky messes from various surfaces with ease using EZ Strip™ All Purpose Remover. Tackle tough jobs from paint drips and spills, to tree sap, grime and grease, to all kinds of graffiti, stickers, and glues. EZ Strip products are water based, skin safe, and fume free. Perfect for use by Professionals, DIYers, and Consumers. Coverage for EZ Strip™ All Purpose Remover is approximately 40 – 60 square feet per quart/litre.